NBA legend Shaquille O’Neal is one of the greatest players to ever step on an NBA court. Selected with the first pick in the 1992 NBA Draft by the Orlando Magic, O’Neal went on to play 19 seasons with 6 different teams. He was the NBA Rookie of the year, a 15 time all-star, league MVP, 8 times ALL-NBA first team member, and a 4 time NBA championship among his list of career accomplishments. Shaq is best known for his 8 years spent with the LA Lakers where he won 3 of his NBA Championships. Known as a fun loving player, Shaq was one of the most dominant players to play the game. He forced opposing teams to change the way they defended him and played him in the waning minutes of the game. Shaquille O’Neal is the latest in a short line of great athletes to be honoured with a unique 'Tegata' memorabilia piece. Utilizing handmade Japanese Fuji paper, O’Neal has inked his right hand in black and included an authentic Inkan stamp which aligns with the traditional craft. The overall keepsake, which measure 36" wide by 36" high, includes a 12" by 12" inset center upon which O’Neal’s hand has been inked and is surrounded by a double-matted collage style background featuring images throughout his career. O’Neal performed the ‘Tegata’ process under supervision of UDA officials and helped in the hand-crafting of 34 uniquely authentic stamps for the release. 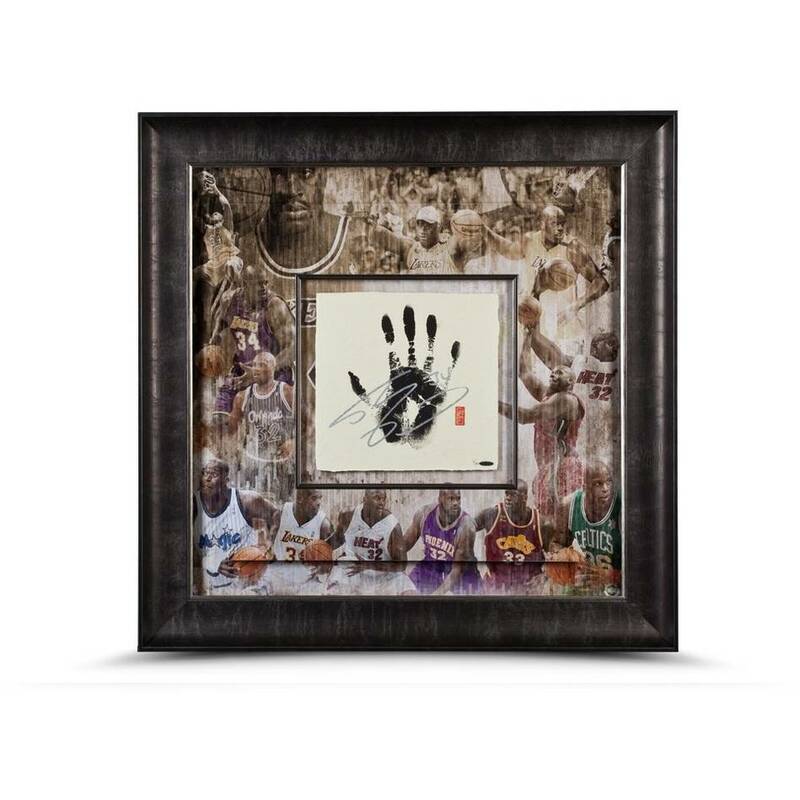 The limited-edition silver autographed hand print is guaranteed authentic by virtue of Upper Deck Authenticated’s Five-Step Authentication Process.